The party was fantastic! The Red Cross of Southeastern Pennsylvania once again proved to be a wonderful host to the 1,200 people who chose to attend this year’s 13th annual Red Ball and support Red Cross House. Altogether, they helped us raise more than $400,000, breaking the record for the most money raised for a single day SEPA Chapter event. We will use this money to continue to provide shelter, food, care and necessities to those who have lost their homes to disaster. Once again, the Please Touch Museum proved to be the perfect venue for our “red tie gala”. My role was to greet partygoers as they arrived to have their pictures taken in front of our Red Cross banner and, I was lucky to be working with our wonderful volunteer photographer, Michelle, who made an effort to make every photograph a great one. Everyone looked fabulous and I especially appreciated several red silk vests adding flare to the classic tuxedo attire of certain gentlemen. Many party goers expressed their admiration for the work of The Red Cross and their pleasure in supporting the work of Red Cross House. I arrived at 4:30 to help set up. For those who have never witnessed the planning and staging that goes on to prepare to host 1,200 people, please understand that it takes a small army of willing, able and energetic workers to carry it off. Last year, I was amazed by the dedication of our volunteers and my opinion has not changed: What a fantastic group of people. Many of our volunteers were working so hard throughout the evening that they missed a few things, like a taste of the seafood at this year’s restaurant winner, Devon Seafood’s table. However, we did try hard to give each other breaks so that we had a chance to wander through the party and enjoy the atmosphere. I sampled many delicious foods during my own short break and may have gotten a little carried away at one of the cupcake stands. I’m very passionate about cupcakes. Never mind. . .it’s important to note that the VIP Lounge had the lower floor all to itself and, while VIP party goers had full access to the rocking party upstairs, downstairs they enjoyed a quieter atmosphere of mellow jazz from artist Gerald Veasley, soft lighting and incredible food from Chef Daniel Stern of R2L. I thought this worked very well. 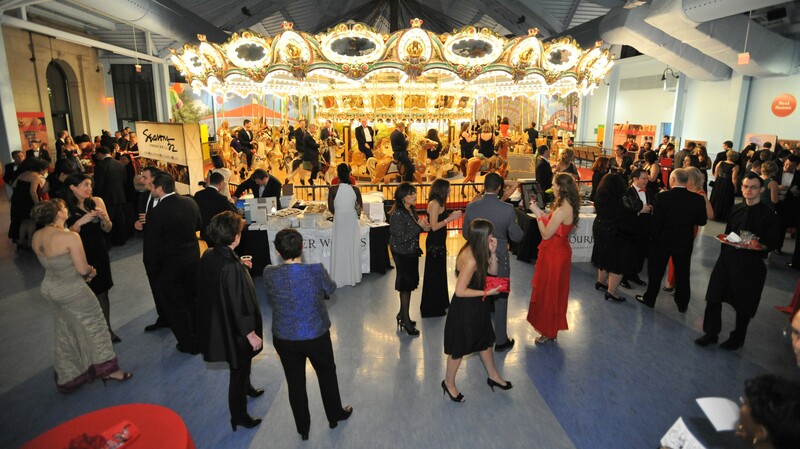 There was plenty of space for the main event party goers to spread out and enjoy themselves, and their access to the carousel added to their enjoyment of the evening. In addition to the food and the music, demonstrations by professional dancers added elegance and sophistication to an already spectacular event. Red Cross House furniture, set up at both entrances, reminded our guests of the why we are so grateful for their support of our work at Red Cross House. All proceeds from The Red Ball directly benefit the House, SEPA Chapter’s one-of-a-kind short-term housing facility in University City where hundreds of local families every year begin their recovery from fires, floods, and other disasters. Several local blogs and news organizations posted photos and news about The Red Ball. Feel free to explore some of the links below.